In Estonia, municipal elections were held in 79 government units on 15th of October 2017. More than 1.1 million registered voters have elected 1,729 local council members from 11,804 candidates at 557 polling stations. For the first time in Estonian election history, 16 years-old were able to vote in the 2017 municipal elections, representing more than 24,000 new voters. 53.3 percent of voters participated in local government council elections. 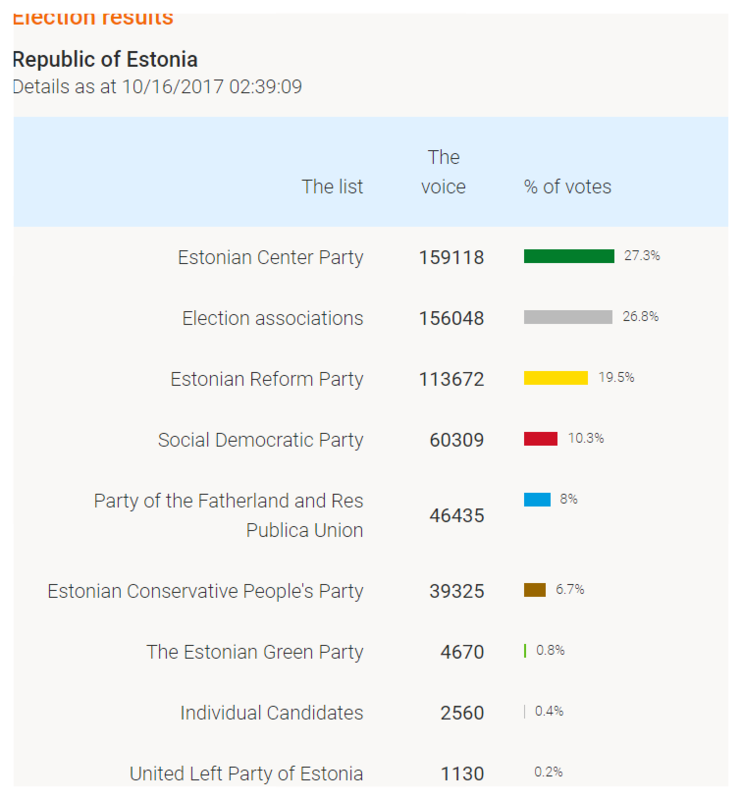 The Center Party (Eesti Keskerakond), the main party of the Estonian ruling coalition, has clearly won the local election. Prime Minister Juri Ratas declared victory for his party that took 27.3 percent of all votes cast in 79 local councils across the nation, beating independent candidates and coalitions that came second with 26.8 percent of votes. The center-right Reform Party (Eesti Reformierakond) came third with 19.5 percent of votes. In the fourth place, the Social Democratic Party (Sotsiaaldemokraatlik Erakond) followed with 10.3 percent. The Center Party has received a clear majority in the city council of Tallinn and will thus continue to appoint the mayor in Estonia’s capital, which has been running out of its ranks since 2005. The highest voters-turnout was in the Võru county (60.1 percent), the lowest in Ida-Viru county with 46.7 percent.